now reading: Do Astronauts Carry Suicide Pills? Imagine you are on a spacewalk. All is proceeding according to plan, when suddenly, the harness tethering you to your spacecraft detaches. As if caught in a scene from your worst nightmare playing out in painfully slow-motion, you find yourself steadily but surely drifting away from your safe moorings, towards the never-ending black expanse of the cosmos. Such a scenario -- the topic of the science fiction flick Gravity -- is an unlikely, although genuine possibility for anyone venturing into space. If faced with such a scenario, what would you do? Hold out for a rescue that's probably not coming? Bite down on your cyanide capsule? But Apollo 13 commander Jim Lovell firmly disagrees. 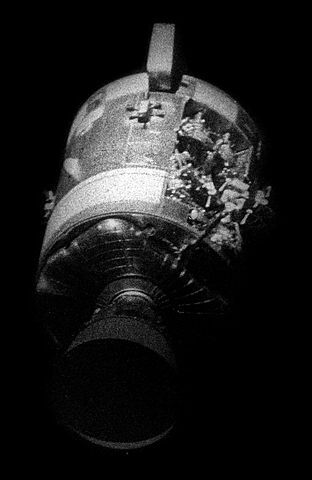 Lovell, along with his fellow crew members Jack Swigert and Fred Haise, actually faced the prospect of being marooned in space when an explosion in their oxygen tanks crippled Apollo 13's service module. "Since Apollo 13 many people have asked me, 'Did you have suicide pills on board?' We didn't, and I never heard of such a thing in the eleven years I spent as an astronaut and NASA executive," he wrote in 1975. Gerry Griffin, a former director of the Johnson Space Center in Houston, Texas, corroborated Lovell's statement, bluntly adding that if an astronaut truly wished to end his or her life, space provides plenty of opportunities. Though no NASA astronaut has ever taken a suicide pill into space, the same cannot be said for their Russian cosmonaut colleagues. Alexey Leonov, the first man to conduct a spacewalk, took one with him on his historical 12-minute stroll on March 18th, 1965, just in case he was unable to return to the spacecraft and his colleague Pavel Belyayev was forced to leave him adrift in orbit. He almost needed it. When trying to reenter his spacecraft, Leonov's stiffened suit became stuck in the entryway. He was forced to depressurize his suit slightly in order to dislodge himself, slide inside the craft, and close the hatch.